A big happy frog, a plump purple cat, a handsome blue horse, and a soft yellow duck-- all parade across the pages of this delightful classic children's book, Brown Bear, Brown Bear, What Do You See? Children will immediately respond to Eric Carle's flat, boldly colored collages. Combined with Bill Martin's singsong text, they create unforgettable images of these endearing animals. Bill Martin, Jr. (1916-2004) was an elementary-school principal, teacher, writer, and poet. 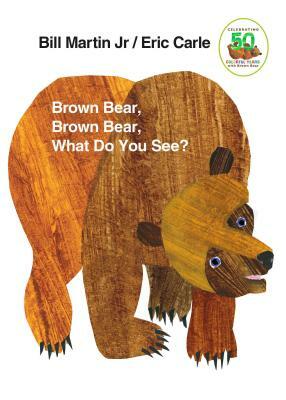 His more than 300 books, among them the bestselling classics Brown Bear, Brown Bear, What Do You See? ; Polar Bear, Polar Bear, What Do You Hear? ; Panda Bear, Panda Bear, What Do You See? ; and Chicka Chicka Boom Boom, are a testament to his ability to speak directly to children. Martin held a doctoral degree in early childhood education. Born in Kansas, he worked as an elementary-school principal in Chicago before moving to New York City, where he worked in publishing developing innovative reading programs for schools. After several years, he devoted himself full-time to writing his children’s books. He lived in New York until 1993, when he moved to Texas. He lived in the east Texas woods, near the town of Commerce, until he passed away in 2004. Eric Carle is one of America's leading children's book illustrators. Born in the United States, he spent some time in Germany where he studied at the Academy of Applied Art in Stuttgart. His work has won many awards and has been published in more than a dozen countries around the world. He is author and illustrator of The Very Hungry Caterpillar and illustrator of Bill Martin, Jr.'s Brown Bear, Brown Bear, What Do You See?